If you are going for trekking in Nepal, you should know about the weather first. That will give you an idea about which weather or season you will be comfortable to trek in. This is no different for the Everest Base Camp Trek. At the higher altitude regions, especially like mountains or the Base Camp regions of mountains, the weather seems to be unpredictable. So it’s vital to know about the seasons in the Everest Base Camp. There are four seasons in the Everest region. Each season has some sort of advantages and challenges while going for the trek. Some seasons can be best to trek in while others can prove to be challenging. In some seasons, you will experience rainfall. There are also seasons where there will be snowfall while on other seasons, the weather is clear. So you need to learn about all the seasons before deciding which season will be perfect for you to trek to Everest Base Camp. Due to different weather and temperature in different seasons, the trekking gear and equipment will also differ. So here is a list of seasons with its time period, temperatures, rainfall as well as wind speed. After reading this article, we expect you to learn about the best time for you to trek to Everest Base Camp. As I have already mentioned, there are 4 seasons in the Everest region. Let us look at the weather patterns of all these seasons in details so that you get a proper feel of the weather of the Everest region throughout the year. Is spring a good time to visit Everest Base Camp? Is Summer a good time to visit Everest Base Camp? Is Autumn a good time to visit the Everest Base Camp? Is Winter a good time to visit the Everest Base Camp? Spring is the season after winter and before summer. Days are bit longer in this season and the temperature becomes warm. But more often you will also experience storm and snowfall at high altitude of Everest Base Camp. Spring is the season where flowers blossom. You can add pleasure to your trek by enjoying different wild species of flowers like Rhododendrons with the beautiful landscape in the lower altitude. This season is perfect for trekking because of its pleasant weather and moderate temperature. Since this season is before summer, the temperature is lower than the summers. Spring season contains three months: March, April, and May. The temperature in March ranges from maximum 7-degree Celsius in the day time to minimum -15 degree Celsius in the night. During April, the temperature keeps increasing with a moderate temperature of maximum 10 degree Celsius in the day to the minimum -10 degree Celsius at night. May is the end of the spring season. The temperature in this season is at a maximum of 15 degree Celsius in the day time and -6 degrees in the night. The weather is still warm and a bit humid. Chances of rainfall are quite low in this season. However, there might be rainfall in the late part of the season. Spring is one of the most popular times to visit Everest Base Camp. This is because of a relatively low amount of precipitation. The mountain views are also, therefore, clear. The freshness of plants and flowers along the way adds a definite richness to your trek in the spring season. Summer falls between June to August in Nepal and sometimes ends in mid-September. Falling after spring and before Autumn, is the hottest season. However, the lower part of the trail becomes muddy, slippery and wet due to rain. During this season, days are longer and nights are shorter. Most of the trekkers don’t prefer to trek in this season. Due to heavy downpour environment. The weather becomes foggy and there are high chances of cloud covering the mountains. So the visibility of the mountains is quite low during this period. Summer season contains three months: June, July, and August. In June the day time temperature ranges from maximum 16 degree Celsius and a minimum -1 degree Celsius in the night. In June and August, the temperatures change slightly. Temperature is around 15 degree Celsius in the day and -2 degree Celsius in the night. If you like trekking in a peaceful environment or you are someone who tries to escape from the crowd, then this season is suitable for you to trek. For solitude lovers, summer is a good time to visit Everest Base Camp. This is due to the fact that this is the off-season. You will also have chances of securing off-season discounts in the summertime. However, there will be occasional interruptions in your trek due to some rainfall. So you might end up extending your trek by a couple of days or more in case your trek is frequently interrupted by rainfall. Start early in the morning for your trek as mornings are generally clear in the summer season. You must also take advise with your guide about trekking and watch out for tricky portions along the way. September, October and November is the autumn season in Nepal. This is the perfect season for trekkers to trek Everest Base Camp. The weather is, more often than not, clear during this season. This gives you an amazing scenery of mountains from the Base Camp. This season is neither too hot nor too cold. Due to favourable condition and temperature at this time period, the region is mostly crowded by a large number of trekkers. It may not be suitable for those who prefer a peaceful environment or overcrowd. Pre-booking may help you to decrease the chances of not getting motels. September is the beginning of the autumn season and the end of summer. Therefore, there is not so drastic change in the weather. The temperature at day is 15 degree Celsius and at night is 2 degree Celsius. Because there is a low amount of rainfall during this month, October is the best month to trek among these three months in the autumn season. The temperature during the day time maximises to 12 degree Celsius and decreases to -9 degree during the night. November is the end of autumn and the beginning of winter. So there will be a slight change in the temperature during the night. The temperature at day time ranges to maximum 6-degree Celsius and at night it tends to decrease to the minimum -15-degree Celsius. So proper trekking gear like a sleeping bag and warm clothes is a must during this period. Autumn season is the best time for trekkers to trek because of its stable and clear weather. Weather is neither too hot nor too cold. Visibility of mountains and other Himalayan ranges is also great during this period. There will be a number of trekkers this season due to its favourable weather. However, it is going to be difficult for those peace-loving trekkers. Winter is the coldest season of the year. This season falls after autumn and before spring. December, January & February is the winter season in Nepal but it also lasts to mid-March. The days are short and the nights are long during this phase. At this time period trekking areas are mostly dry. At this season temperature at low altitude is bearable compared to upper altitude. The average temperature ranges between 20 degree Celsius in the day to -17 degrees in the night. You might experience freezing cold at night. The temperature at night minimizes from -20 degree to -30 degree Celsius. So proper gear is a must if you’re travelling during this month. During this month, you have to face stormy wind which can make your trekking more challenging and adventurous. Heavy discounts may be given on tickets during these months due to lack of trekkers. Weather during the winter season may not be as pleasant as Autumn to trek. Snowfall at higher altitude may make your journey tough but can be suitable if you love challenging and adventurous trek. You can see that the weather of the Everest region is different each season and places from a given table. 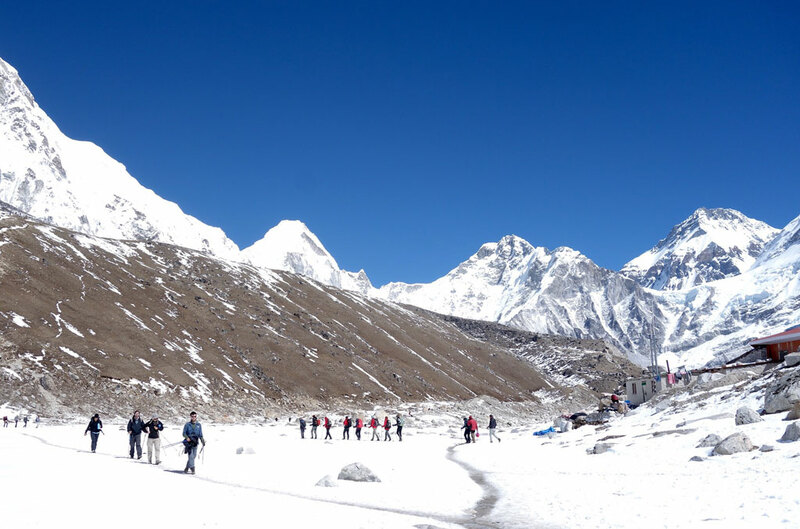 You can trek in all seasons to the Everest Base Camp. However, you need to identify which one would be the best season for you depending upon your personality when you can manage time, and what you are expecting in your trek. And you should pack according to the needs of the seasons.